Catherine, Beal, and Wasif quickly find themselves in over their heads after they arrive on another world, where they encounter a powerful alien warrior. Wasif arrives through the Stargate after an astonishing experience, followed in short order by Captain James Beal and Catherine Langford. They quickly make a series of discoveries about their alien environment: the D.H.D., apparently capable of dialing the Stargate quickly and easily; the fact that the address they used to reach this world won’t get them back; and the three moons of Abydos hanging in the daytime sky out the window. They are definitely not on Earth any more. They continue to explore the temple they have gated into, weapons drawn, while Catherine searches Brücke’s journal for another gate address. Soon they come upon the throne room where Brücke’s team encountered Aset (Episode 3) — complete with the German Gunter still lying dead on the floor. But they haven’t noticed a young Abydonian man in the building, who was studiously washing the Stargate by hand moments before the came through. Wasif has only found the water buckets left behind by the boy — who he is keeping an eye on them from the shadows. While Cat and James argue, Wasif stumbles into a threat unlike any he has ever seen: Serqet, an alien warrior, growls back at him from the temple shadows. But when she knocks him out they hear the sound, and James attempts to lure out the still unseen hostile. The warrior approaches with a staff weapon at the ready and Catherine shoots at her, grazing her arm. Serqet fires back a powerful blast from the alien weapon, and James jumps in to engage her in hand-to-hand combat. Serqet is highly skilled and soon has James on his back. When he grabs at her wrist Catherine notices that a device activates a set of rings, which descend from the ceiling directly behind Aset’s throne. As the three continue to fight Catherine loses her hair pin on the floor. It is clear that Serqet is the superior warrior, and that they have little hope of defeating her by any conventional means. The fight takes them behind the throne, where a revived Wasif leaps out and tries to fire his weapon at the alien — but it doesn’t work. She throws him to the ground and turns her staff on a defenseless James. With the warrior momentarily distracted Catherine hits Serqet’s wrist device with a stick, activating the rings right on top of her. The alien is transported away. Catherine, James, and Wasif regroup … only to be surprised when the Abydonian reveals himself to them. Catherine tries to communicate with the boy, who is trying to convince them to follow him. The rings activate once more and they make a hasty retreat, with the Abydonian in tow. Serqet returns — picking up Catherine’s pin. The Abydonians appear to revere the Stargate and its connection to their gods. The young Abydonian man is seen hand-washing the gate itself with a rag and a bucket of water — which would explain why everything inside Aset’s temple is so neat and tidy. 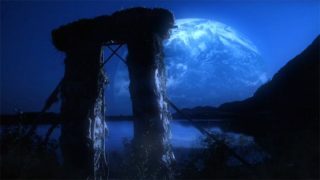 Catherine comes through the Stargate for the first time and reports having seen what she thought were stars — much like the audience sees during a trip through the wormhole (Episode 3). In fact she wouldn’t have “seen” anything in the biological sense, as her eyes were demolecularized at the time. More likely is that gate travel has a psychological effect upon travelers, who experience something akin to what we as the audience see inside a wormhole in the brief time it takes to traverse from one gate to the other. In Egyptian mythology, Serqet is a goddess often depicted with (or as) a scorpion. She was a consort of Horus (Heru’ur), and closely associated with the goddess Isis (an alternate name for Aset). Serqet’s staff weapon is unlike any seen on Stargate previously, and may be a weapon of her own creation. One end has the familiar staff head, capable of delivering powerful blasts of energy. But the other has a curved blade, making the weapon useful for hand-to-hand combat. That Aset and Serqet’s hosts are perhaps a non-human, alien species (see our analysis for Episode 3) is supported by Serqet’s almost animalistic growls and hisses at her enemies. The mannerism could be something the Goa’uld picked up from its host’s culture. Wherever it is that the transport rings sent Serqet, it takes her nearly three full minutes to ring back to the temple. The Abydonian in this episode is in fact credited as Kasuf, who in the future will become the leader of his people (played by Erick Avari in the feature film and SG-1). He seems a bit old considering Origins is set circa 1938. Assuming he is perhaps as young as 16 years old here, that would still make him nearly 80 years old in his final SG-1 appearance (Season Four’s “Absolute Power”). The transport rings visual effect matches that of the feature film (even lifting at least one shot straight from the movie), with nine rings stacked atop one another. This was changed in Stargate SG-1, where ring transporters have five larger rings instead. 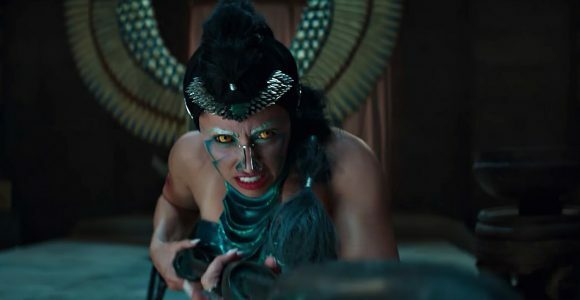 The Abydonian-Goa’uld language in Stargate Origins is a match to what is spoken in the feature film, with recognizable words and phrases such as “na-nay” (“No!” or “You must not!”). The language is meant to be an evolution of ancient Egyptian — thus the archaeologist characters’ ability to figure out how to speak it. Catherine Langford – Catherine’s father was apparently keen on her knowing how to protect herself. She learned to shoot a gun when she was 15 years old. James Beal – Beal has a brash and arrogant side that comes out when he is under pressure, a bit sexist and eager to have others follow his lead. He is also something of a pragmatist, warning Catherine in the face of a hostile alien world that her elderly father may already be dead. Where did the transport rings send Serqet? Is there a ship in orbit? Who is the Abydonian boy? Where will he lead Catherine and the others? Will Catherine and the others be able to locate the address to dial back to Earth? Does Brücke have a record of it? VOTE! How would you rate Stargate Origins "Episode 4?"